The S.S. Untied States has a very extensive and somewhat sad history, but it sure isn’t anything short of interesting. In the early 1940s, World War II was being fought in full force. Something that the US Army noticed during this time was Britain’s enormous and fast ocean liners. More specifically, the Queen Elizabeth and the Queen Mary. Both of these ships were able to carry over 10,000 troops, and reach high speeds of 28 knots. The US Army’s previous ship, the S.S. Normandie, had caught fire and sunk in New York City. This prompted the Army’s order of a new ocean-liner that was capable of reaching high speeds and strong against any disaster. The Armed Forces and the United States Lines, a cargo and transport company, teamed up to commission this new ship. The final design of the S.S. United States was drawn by William Francis Gibbs, a famous Naval architect. The new ship cost nearly $79 million. This was a lot back then. It’s equivalent to $820 million today. By the time the construction began on the new vessel, WWII had already come to an end. It had been decided that the primary purpose of the United States would be for ocean crossings. The ship took from 1950 to 152 to build. Wood had barely been used on the ship, and was only allowed in the kitchen for cutting boards, and in the lounge for a piano (which was even made out of special fire proof wood). This made the ship almost fire proof, and could withstand the most extraneous of disasters. The hull was also built of many water tight compartments in order to allow for a long period of time for evacuation in case of flooding. The rooms on-board the United States were absolutely luxurious. It was designed to match the era of the 1950s. The S.S. United States was the most technologically advanced piece of machinery at the time. Much of the technology on-board was classified, as the ship was able to be quickly converted into a troop ship in case of war. On July 3, 1952, the S.S. United States sailed her maiden voyage from New York City to Cornwall, England. She set the world record of being the fastest ocean-liner of her size to cross the Atlantic. This record was previously claimed by the Queen Mary. In fact, the United States still holds the record to this day with a top speed of 36 knots and a total of 3 days and 10 hours. The United States continued to sail these transatlantic crossings for the next decade. However, by the 1960s, air travel had become more and more popular. This caused the demand for transatlantic crossings to fall significantly. The S.S. United States’ sister ship, the S.S. America, had already been sold by the United States Line, and taken of transatlantic crossings. Side story: The S.S. United States met her maker in the 1990s as she was being towed to Thailand. The ship broke off in a bad storm, and soon washed up on a beach in the Canary Islands. She was beaten by waves until there was nothing left. By 1969, both the Queen Mary and the Queen Elizabeth had been take off of the ocean crossings, and the United States was proving to be no longer profitable. The ship was brought to Virginia to undergo refurbishments. However, after extensive assessment, the United States Line made the decision to sell the vessel. For the next couple of years, the ship sat in port awaiting a buyer. Eventually in 1976, the ship was purchased for $12 million. In 1977, the United States had made its way to Atlantic City, where plans were drawn up to turn the ship into a hotel and casino. The owner promised to keep the original concept, but the plan never came to be. The idea then shifted to selling condos on-board. Around this time, the idea of cruising had become very popular. Many cruise lines were jumping at the idea of buying older ships for their fleets and converting them into modern cruise ships. In 1978, Richard Hadlee purchased the vessel in hopes of converting it into some kind of floating time share ship. However, the cost required to make these changes reached over $200 million. There just weren’t any sufficient funds to make this dream a reality. Also at this time, Norwegian Cruise Line was looking into purchasing the United States for Caribbean sailings. However, they ended up purchasing the similarly designed S.S. France. 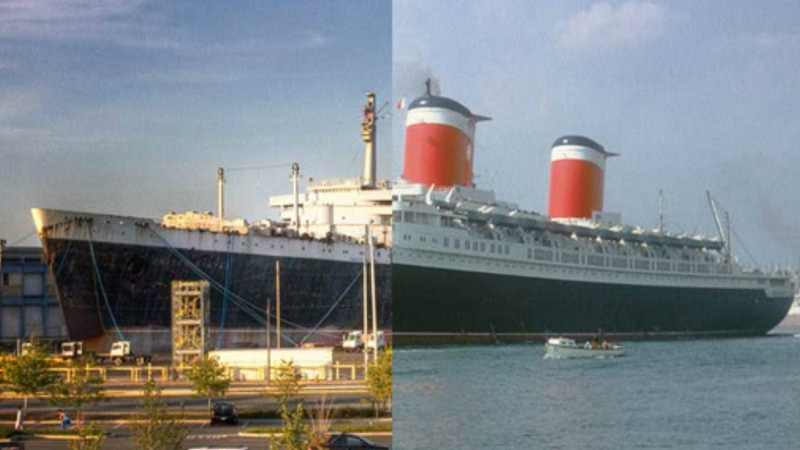 The S.S. United States remained abandoned and unused throughout the 80s and into the early 90s. The remaining interior fittings were sold at auction, and the ship was once again listed for sale. Marmara Marina Inc. then purchased the vessel for $2.6 million. They purchased the vessel with the intent of refitting the ship and turning it into a modern cruise ship. The ship was then towed to Ukraine. There, she underwent and extensive gutting to remove all asbestos used within the ship. This project wrapped up around 1994. However, the renovation costs reached $150 million, and the project was scrapped. At this time, scrapping had become a major consideration. The United States was then towed back to America, and docked in Philadelphia. In 1996, the S.S. United Stated was purchased by a private individual for $6 million. The owner was an advocate for saving the historic ocean-liner, and successfully had the ship listed on the National Register of Historic Places, along with setting-up many conservancy foundations. When the man died in 2002, the ship was passed onto his son. A year later, Norwegian Cruise Line purchased the ship with the same intent they had when they were considering the ship 25 years earlier. This was around the time when NCL began their subsidiary line, NCL America. It was to be a fleet of American built and flagged vessels that would sail exclusively to domestic ports. They had already ordered the Pride of America at the time. Over the next few years, NCL kept the ship docked in Philadelphia while they conducted studies on the feasibility and cost of a renovation. The assessment showed great results. In 2006, NCL chairman stated the the line was still committed to bringing the United Stated into their fleet. However (yes another however), the economic climate began to fall, and tourism took a turn for the worst in 2008. All ships but Pride of America were pulled from service for NCL America, and transferred to the NCL fleet. It didn’t make sense for the cruise line to spend millions of dollars on an ocean-liner built in the 50s, and rumors began to spread in 2009 that NCL was going to scrap the ship for some quick cash. The S.S. United States Conservatory soon jumped in and raised the necessary funds to save the ship. NCL was very reluctant to sell to the conservancy, but ended up taking $3 million for the vessel. After the purchase, an idea was proposed in 2010 to turn the ship into a multipurpose entertainment complex on the Philadelphia ocean-front. It would include a new casino, that was never actually able to secure a gambling license. This idea soon fell apart. For the next few years, the conservancy was aggressively trying to find a developer to take the United States out of Philadelphia, which had been deemed unsuitable for the ship to permanently remain in. The conservancy funded some work to be done on the hull to maintain the appearance. However, most donations to the conservancy went towards rent and upkeep of the United States. Rent was reportedly as high as $80,000 a month. A new plan arose to move the vessel to New York City where she would become an entertainment hub in the harbor. Even though this concept was greatly pushed in 2014, nothing ever came of it. The conservancy soon began to lose hope, and started talks of scrapping the vessel. Another idea to turn the United States into a museum came up, but once again was shot down due to the necessary funds to renovate the ship. Miraculously, in February of 2016, Crystal Cruises, a luxury cruise line, began to show interest in purchasing the United States. They drew up new plans for her to sail as a modern cruise ship, and conducted studies on the feasibility of the plan. As a result, they offered to pay docking expenses for 9 months. The plan involved extreme changes to the ship’s upper decks. JUST KIDDING! After their research, they deemed the project to have too many commercial and technological challenges, and Crystal dropped out. They did donate $350,000 to the conservancy, however. And here we are today. 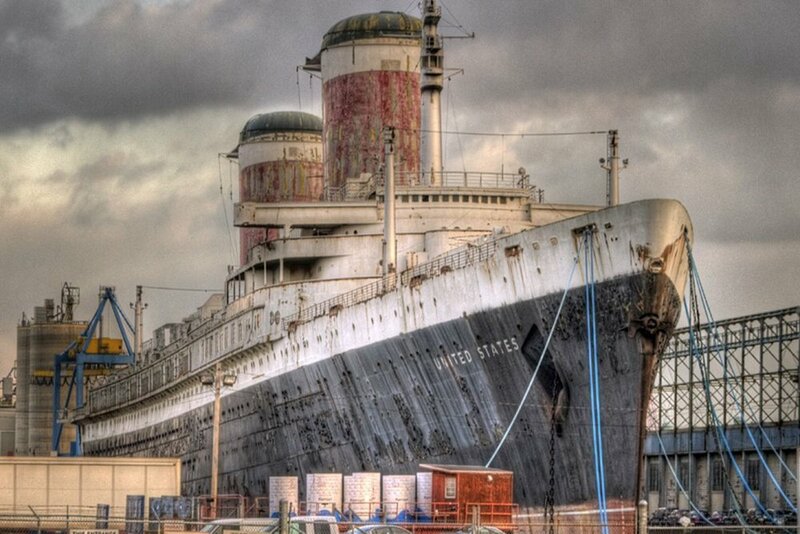 The S.S. United States is slowly decaying in the Philadelphia harbor. She’s served a pretty amazing, but short life. The United States only sailed ocean crossings for a total of 18 years. After that, she saw many owners and many different concepts. I love this ship and its story. It’s incredible. She was an icon and a technological marvel for the country that she served. If I had the money to save her and renovate her, I would, even if the logistics seemed off. There have been talks to turn her into an underwater reef, but that’s not what I wish to see. Who knows what will happen to this ship, but hopefully it’s something honors the incredible story she’s lived.